and forget not to pour in your milk into the plate before you set it up on the chaffin dish. 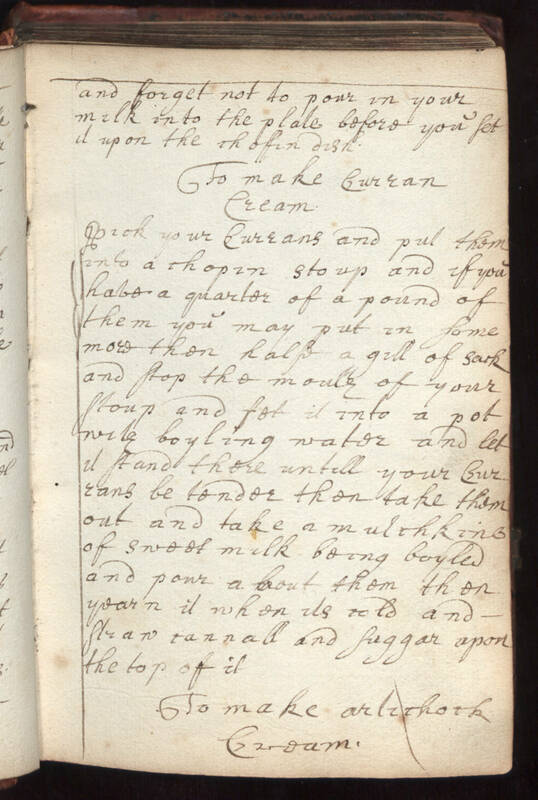 To make Curran Cream. Pick your Currans and put them into a chopin stoup and if you have a quarter of a pound of them you may put in some more then half a gill of sack and stop the mouth of your stoup and set it into a pot with boyling water and let it stand there untill your currans be tender then take them out and take a mulchkine of sweet milk being boyled and pour about them then warm it when its cold and straw cannall and suggar upon the top of it. To make artichock Cream.